غفاری, علی, خدایاری, علیرضا, موثق, شیرین. (1396). بررسی میزان انعطاف‌پذیری بازوی زنجیره‌های پروتئین شوک حرارتی کوچک به عنوان نانوعملگر. نشریه پژوهشی مهندسی مکانیک ایران, 19(1), 19-33. علی غفاری; علیرضا خدایاری; شیرین موثق. "بررسی میزان انعطاف‌پذیری بازوی زنجیره‌های پروتئین شوک حرارتی کوچک به عنوان نانوعملگر". نشریه پژوهشی مهندسی مکانیک ایران, 19, 1, 1396, 19-33. غفاری, علی, خدایاری, علیرضا, موثق, شیرین. (1396). 'بررسی میزان انعطاف‌پذیری بازوی زنجیره‌های پروتئین شوک حرارتی کوچک به عنوان نانوعملگر', نشریه پژوهشی مهندسی مکانیک ایران, 19(1), pp. 19-33. غفاری, علی, خدایاری, علیرضا, موثق, شیرین. بررسی میزان انعطاف‌پذیری بازوی زنجیره‌های پروتئین شوک حرارتی کوچک به عنوان نانوعملگر. نشریه پژوهشی مهندسی مکانیک ایران, 1396; 19(1): 19-33. در این مقاله رفتار پروتئین چپرون شوک حرارتی کوچک در برابر تغییر دما براساس شبیه‌سازی دینامیک مولکولی مورد بررسی قرار گرفته است. تغییرات ساختاری در دمای نرمال و متغیر، برای یک و دو زنجیره از پروتئین مورد بررسی قرار گرفته است. نتایج نشان می‌دهد میزان انعطاف پذیری بازو به حدی است که کاهش دما در شبیه‌سازی یک زنجیره سبب بسته شدن بازو و کاهش جابه‌جایی مرکز جرم می‌شود. در شبیه‌سازی دو زنجیره نیز کاهش دما سبب بسته شدن بازوی یکی از زنجیره‌ها و باز شدن بازوی زنجیره دیگر می‌شود. این رفتار متضاد در جابه‌جایی مرکز جرم پروتئین نیز مشاهده می‌گردد. A Report by the Interagency Working Group on Nano Science, "National Nanotechnology Initiative: Leading to the Next Industrial Revolution", pp. 15-19, Engineering and Technology Committee on Technology, National Science and Technology Council, Washington, D.C, (2000). Kharwade, M., Nijhawan, M., and Modani, S., "Nano Robots: A Future Medical Device in Diagnosis and Treatment", Research Journal of Pharmaceutical, Biological and Chemical Sciences, Vol. 4, No. 4, pp. 1299-1307, (2013). Sujatha, V., Suresh, M., and Mahalaxmi, S., "Nanorobotics - a Futuristic Approach", Indian Journal of Dentistry, Vol. 1, No. 1, pp. 86-90, (2010). Drexler, E.K., "Engines of Creation 2.0: The Coming Era of Nanotechnology", 20th Anniversary ed., Oxford University Press, Oxford, (2006). Freitas, R.J., "Nano Medicine, Volume I: Basic Capabilities", Landes Bioscience, Georgetown, Texas, pp. 1-13, (1999). Freitas, R.J., "Nano Medicine, Volume IIA : Biocompatibility", Landes Bioscience", Georetown, Texas, pp. 74-78, (2003). Freitas, R.J., "Exploratory Design in Medical Nanotechnology: A Mechanical Artificial Red Cell", Artificial Cells, Blood Substitutes, and Immobilization Biotechnology, Vol. 26, No. 5, pp. 411-430, (1998). Freitas, R.J., "Microbivores: Artificial Mechanical Phagocytes using Digest and Discharge Protocol", Journal of Evolution and Technology, Vol. 14, No. 4, pp. 1-52, (2005). Freitas, R.J., "Clottocytes: Artificial Mechanical Platelets", Accessed on 11 November (2015); http:// www.imm.org/publications /reports /rep018/. Hamdi, M., and Ferreira, A., "Design, Modeling and Characterization of Bio-nanorobotic Systems", Springer Dordrecht Heidelberg London New York, pp. 1-36, (2011). Richardson, R.T., Alekseev, O.M., and Grossman, G., "Nuclear Autoantigenic Sperm Protein (NASP), a Linker Histone Chaperone that is Required for Cell Proliferation", Journal of Biological Chemistry, Vol. 281, No. 30, pp. 21526–21534, (2006). Alekseev, O.M., Richardson, R.T., Alekseev,O., and O'Rand, M.G., "Analysis of Gene Expression Profiles in HeLa Cells in Response to Overexpression or SiRNA-mediated Depletion of NASP", Reproductive Biology and Endocrinology, Vol. 16, No. 7, pp. 45, (2009). Pauwels, K., "Chaperoning Anfinsen: The Steric Foldases", Molecular Microbiology, Vol. 64, No. 4, pp. 917-922, (2007). Ellis, R.J., and Van der Vies, S.M., "Molecular Chaperones", Annual Review of Biochemistry, Vol. 60, No. 11, pp. 321–347, (1991). Van Montfort, R., Slingsby, C., and Vierling, E., "Crystal Structure and Assembly of a Eukaryotic Small Heat Shock Protein", Nature Structural Biology, Vol. 59, No. 12, pp. 105–156, (2001). Jakob, U., Gaestel, M., Engel, K., and Buchner, J., "Small Heat Shock Proteins are Molecular Chaperones", Journal of Biological Chemistry, Vol. 268, No. 3, pp. 1517–1520, (1993). Horwitz, J., "Alpha-crystallin Can Function as a Molecular Chaperone", Proceedings of the National Academy of Sciences, Vol. 89, No. 21, pp. 10449–10453, (1992). Fan, Q., Huang, L. Z., Zhu, X. J., Zhang, K. K., Ye, H. F., Luo, Y., Sun, X. H., Zhou, P., and Lu, Y., "Identification of Proteins that Interact with Alpha A-crystallin using a Human Proteome Microarray", Molecular Vision, Vol. 20, No. 9, pp. 117–124, (2014). Ghaffari, A., Shokuhfar, A., and Hasanzadeh Ghasemi, R., "Capturing and Releasing a Nano Cargo by Prefoldin Nano Actuator", Sensors and Actuators, B: Chemical, Vol. 171-172, No. 1, pp. 1199-1206, (2012). Ghaffari, A., Shokuhfar, A., and Hasanzadeh Ghasemi, R., "Design and Simulation of a Novel Bio Nano Actuator by Prefoldin", 10th IEEE Conference on Nanotechnology, pp. 885-888, (2010). 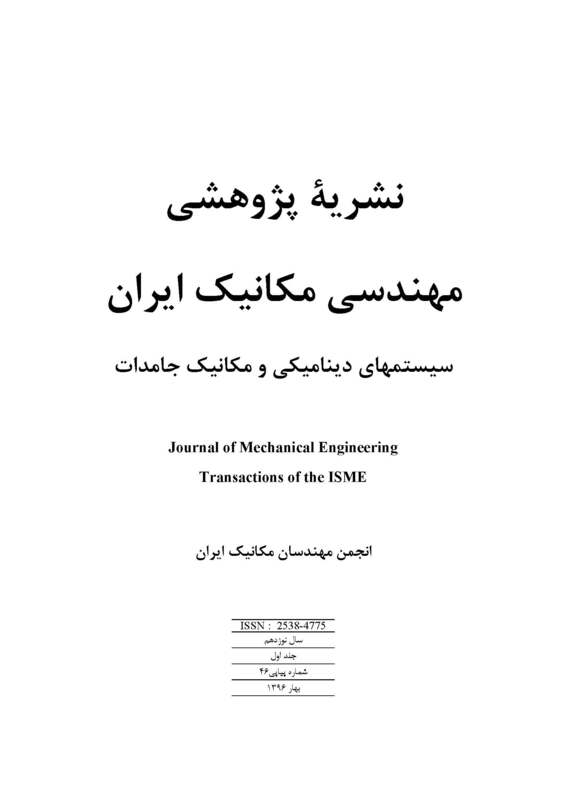 Ghaffari, A., Shokuhfar, A., and Hasanzadeh Ghasemi, R., "Prefoldin: A Nano Actuator for Carrying the Various Size Nano Drugs", Journal of Computational and Theoretical Nanoscience , Vol. 8, No. 10, pp. 2078-2086, (2011). Narberhaus, F., "Crystallin-type Heat Shock Proteins: Socializing Minichaperones in the Context of a Multichaperone Network", Microbiology and Molecular Biology Reviews, Vol. 66, No. 1, pp. 64–93, (2002). Kennaway, Ch. K., Benesch, J. L. P., Gohlke, U., Wang, L., Robinson, C.V., Orlova, E.V., Saibi, H.R., and Keep, N. H., "Dodecameric Structure of the Small Heat Shock Protein Acr1 from Mycobacterium Tuberculosis", The Journal of Biological Chemistry, Vol. 280, No. 39, pp. 33419–33425, (2005). Foloppe, N., and MacKerell, A.D., "All-atom Empirical Force Field for Nucleic Acids: I. Parameter Optimization Based on Small Molecule and Condensed Phase Macromolecular Target Data", Journal of Computational Chemistry. Vol. 21, No. 2, pp. 86–104, (2000). Kumar, Ch.V., Kumar, K.M., Swetha, R., and Ramaiah, S., "Protein Aggregation Due to nsSNP Resulting in P56S VABP Protein is Associated with Amyotrophic Lateral Sclerosis", Journal of Theoretical Biology, Vol. 354, No. 8, pp. 72-80, (2014).